People of all ages can benefit because treatment is tailored to the individual and not solely to the disease. Many people refer themselves directly without consulting their GP. Registered osteopaths are trained to assess whether osteopathy would be appropriate for a particular patient or whether they should be referred to their GP for some other form of treatment or for X-rays or blood tests. The distinctive manual skills of a registered osteopath in diagnosis and treatment are increasingly accepted by the medical profession as a safe and useful therapy for patients suffering from pain and disability in the musculoskeletal system. Many patients are sent to this practice by their GP. It may be necessary for you to get undressed down to your underwear in the part of your body which needs to be examined. Some men like to bring shorts to wear, and some women like to wear a gown which is available. 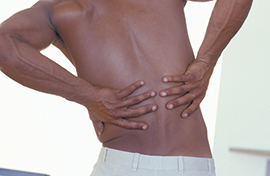 What is the scope of a Registered Osteopath’s training? 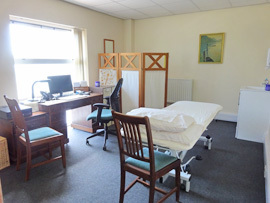 Along side this, the osteopath learns to examine patients, and perform the techniques required to treat mechanical disorders of the body’s framework, developing palpatory skills which enable them to assess the condition of joints and muscles. An important part of their training is learning to recognise conditions which they cannot help and which should be referred on to the patient’s GP. How long is a registered osteopath’s training? Did Alison Allott train as an osteopath on leaving school? No, she did a BSc degree in Zoology first. Looking for an osteopath in Shropshire?